We are so excited to run with you at the Dubai Women’s Run this weekend! Lizi’s Granola, 5gm Hunter’s Gourmet Flax Seeds, 5gm Hunter’s Gourmet Chia Seeds, 5gm Hunter’s Gourmet Cocoa Nibs, 1/2 cup of Full Fat Greek Yoghurt, half a fruit (apple, kiwi, clementine). – 1st Alternative: 2 slices Rye or Norlander bread or 2 pieces of Nairn’s Organic Super Seeded Oatcakes with 1 spoon of peanut butter on each, 5gm Hunter’s Gourmet Wheat Grass powder dissolved into 35ml-50ml of water, half a fruit (apple, kiwi, clementine). – 2nd Alternative: 2 strips of Turkey Rashers, 2 eggs (any style) 1 slice of Rye bread or Nairn’s Organic Super Seeded Oatcake, half a fruit (apple, kiwi, clementine). Open an ice cold Gatorade of your choice. Electrolytes and sugars are important to building your body towards exertion. Protein, Fiber and Carbs of your choice, feeding the body throughout the day is key. Suggestion: grilled Chicken/fish/tofu, 1 cup mixed vegetable (broccoli, cauliflower, green beans, carrots), 1/2 cup (cooked) Hunter’s Gourmet White or Tri-color Quinoa. Enjoy 1 fruit of your choice with half a cup of full cream Greek Yoghurt, or a sugar controlled snack bar, preferably higher in protein. Pasta, Hunter’s Gourmet Quinoa, Protein (chicken, fish, tofu) and alfredo sauce. Enjoy this meal by opening your second ice cold bottle of Gatorade (or similar electrolyte based product). This is a good mix of protein, carbs and fat, to carry your body through to the following morning. One additional tip: Try to lay off the spicy food or food that you are not familiar with, or that you have not prepared yourself. Your stomach may be sensitive to certain ingredients. Try to wake up at least 2 hours before race time. Upon waking, consume 1 large glass of temperature controlled water. 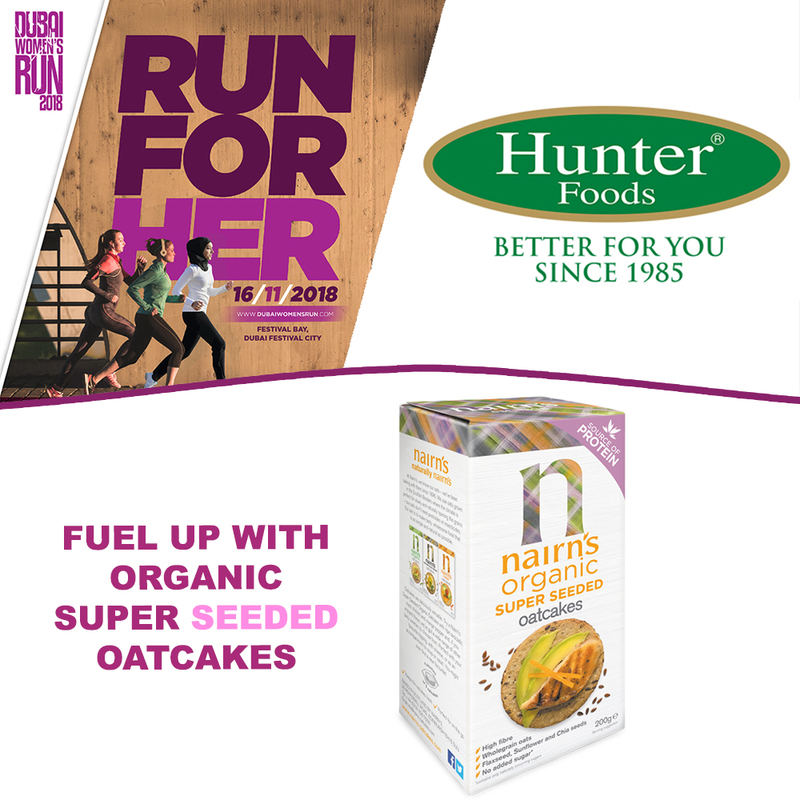 Enjoy your Lizi’s On The Go or Nairn’s Superseeded Oatcakes. Sip on a Gatorade as you head to the event or a bottle of water. Try to limit your intake within an hour of race time, to avoid unnecessary toilet breaks. Stretch well and enjoy your run, full nourished & hydrated! Lastly and by all means most importantly, HAVE FUN! P.S. 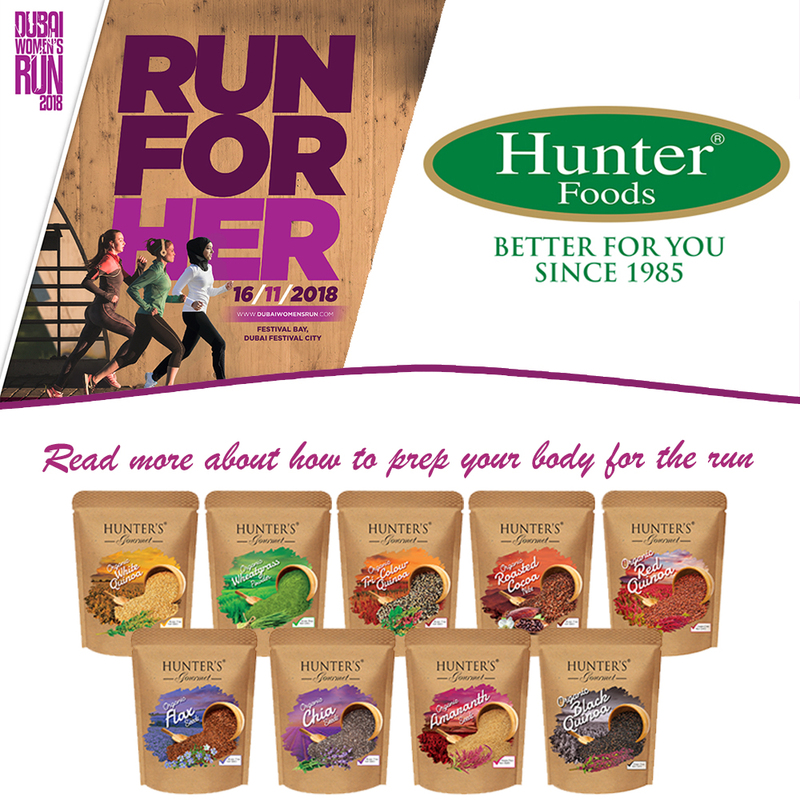 once you have finished your run, enjoy some Hunter’s Gourmet Organic Roasted Cocoa Nibs to help the body regulate the sugars lost during the run.